The U.S.-Russia Business Council, in cooperation with the U.S. Embassy Consular Section, is pleased to offer an Expedited U.S. Visa Processing for senior and mid-level management of USRBC member companies. Under this program, qualified USRBC member-company employees are eligible for expedited U.S. Visa interview slots. Program eligibility criteria are listed below. -- Your visa application photo must be taken within the last six months. If you are renewing a previous visa, this generally means your photo must not be the same one that appeared on your old visa. Submitting photos that do not meet these criteria can delay the visa application process. -- The application fee is $160. 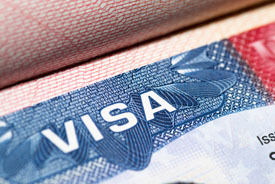 Russian citizens applying for a B1/B2 visa are eligible for a three-year, multi-entry visa and pay no reciprocity fee. Complete the Nonimmigrant Visa Electronic Application (DS-160) form. Choose ‘Russian’ in the dropdown menu at the top right of the screen to view the application with Russian translations. After completing the form, print and save your confirmation page: https://ceac.state.gov/genniv/. For payment process details, please visit: http://www.ustraveldocs.com . Please send a letter to a USRBC employee and include the following: - a copy of DS-160 confirmation page; - a scanned copy of the U.S. Embassy fee payment receipt; - a scanned copy of the travelling passport; - a letter from the employer stating applicant's start date at the member-company, monthly salary, purpose of travel. Please wait for the USRBC to inform via email and/or phone of the date and time of the applicant's interview with a U.S. Embassy Consular Section official. Applicants must be full-time employees of USRBC member companies, or accompanying them immediate relatives (a spouse and/or children under the age of 18). Applicants must be traveling to the U.S. for only the purpose of short-term business. The employee is seeking to travel to the U.S. for purposes other than short-term business. The employee is with the member company on a part-time, short-term, or internship basis. The applicant is not directly employed at a USRBC member company, i.e. a business/personal associate or an employee of a partner or an affiliated company. The applicant is a contractor of a USRBC member company. Please note that this program does not guarantee a U.S. visa issuance. Please also note that based on the U.S. Homeland Security regulations, applicants engaged in scientific and/or technical fields must allow for a 2 months visa processing time. Please note that if you need help with your visa application or want to learn more about obtaining a visa to travel to the United States you can contact a U.S. Consulate customer service representative using the telephone number: +7 (495) 745-3388 from 8:00am to 8:00pm. We are pleased to offer this service to our members.